The new optris infrared camera PI 05M has an optical resolution of 764 x 480 pixels and measures at a wavelength of 500 to 540 nm. Thanks to its special spectral range, measurement errors resulting from unknown or changing emissivities are reduced. The camera features a continuous measurement range from 900 to 2000 °C. 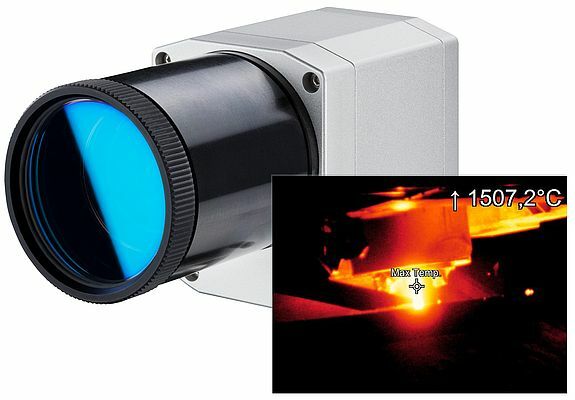 The PI 05M is another compact thermal imager, developed for the worldwide metal industry. It is especially suitable for temperature measurement of molten metals. The optris PI 05M measures surfaces continuously from 900 to 2000 °C. At a frame rate of 1 kHz, measurements can be conducted with an optical resolution of 72 x 56 pixels. This region of more than 4000 pixels can be freely positioned. Additionally, there is a direct real-time analog output, again featuring a freely positionable 8 x 8 pixel region. These possibilities offer an optimal adaptation to the respective application. The camera detects IR radiation in the spectral range between 500 and 540 nm and is therefore ideally suited for laser processing applications as radiation above 540 nm is blocked excellently. The, for the metal sector commonly used diode lasers in the range of 900-1030 nm and Nd:YAG laser at 1064 nm have thus no disturbing influence on the measurement. The camera works here without the need for additional filters. A general advantage of measuring metals at this short wavelength is a significant reduction of measurement errors resulting from changing or unknown emissivities. There’s no two ways about it: our flexible infrared cameras provide simple, trouble-free connection to tablets via USB. Also interested in really fast, rugged, light, accurate, customised and inexpensive infrared thermometers and cameras for non-contact measurements between –50 °C to +3000 °C? There’s no two ways about it: our flexible infrared cameras provide simple, trouble-free connection to tablets via USB. Also interested in really fast, rugged, light, accurate, customised and inexpensive infrared thermometers and cameras for non-contact measurements between –50 °C to +3000 °C? Visit our website to learn more. Optris' flexible infrared cameras provide simple, trouble-free connection to tablets via USB. They also offer fast, rugged, light, accurate, customised and inexpensive infrared thermometers and cameras for non-contact measurements for -50 to 3000ºC.